We work under a "Send me a FREE Estimate first" system, that means you will always know beforehand how much the order would cost you, then we proceed only if you agree with the Estimate. 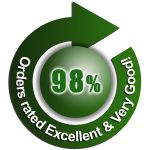 Quality: Constantly reaching more than 98% of the orders rated as "Excellent" (82.5%) and "Very Good" (15.5%) by our Customers. Quality II: Only 1 re-work request every 25 orders ratio; most re-work requests ask for minor changes. Wholesale Prices (restrictions apply): Starting at US $ 9.95. up to US $ 34.95 for orders that may take up to 6 hours of work. Turnaround time: 80% of the restorations delivered, on average, in less than 24 hours. Reliability: 0 orders delivered out-of-time since company creation back in year 2000. We are passionate and we love what we do. We are focused on being the BEST photo restoration company in the world, not the biggest. We are focused on QUALITY, not on quantity. We are a problem solving company, not a problem creator company.